Why would you choose UUkeys Windows Password Recovery tool? There’s nothing more disappointing than booting your PC instead of being logged in to your desktop but denied access owing to incorrect Windows user account password. You could be sure that you have been using the same user account password since you bought your PC till your previous login but being denied to access your PC and files. The only option either look like recover windows user account password or formatting. Forgetting one’s user account password can be as a result of different factors. It could be someone else tampered with your current password in attempt to login to your PC, you just a used PC from Ebay with locked user account or some personal circumstances. But you don’t need to worry – UUkeys Windows Password Recovery offers the easiest guide to redeem your PC from this password threat. I have tried other Windows password recovery tools but UUkeys Windows Password Recovery works seamlessly in all versions of Windows OS. You can reset XP, Windows 7, 8, 10 password with just one tool. It provides two flexible ways to create a reset disk: USB and DVD/CD. UUkeys Windows Password Recovery allows you to create a Windows password reset disk to remove forgotten password. UUkeys does not delete your files, documents or settings. It only wipes and reset old forgotten windows password within some short times. UUkeys burns its installation files into your media type (DVD, CD or USB flash) to be used to reset Windows password. For your conveniences, you have the option to either create a Windows password reset disk using a CD/DVD or USB flash drive. Due to the challenges one may face with CD/DVD ROM, USB flash drive will be common and easier to use. What you must need next is finding the keyboard combinations to your BIOS to set boot order. Different PC brands have different combinations or a single keyboard hit. Here are some popular keyboard keys – ESC, F1, F2, F8, F10…You can find your whenever your PC boots from the text at the left bottom of your screen. NOTE: To use UUKeys password recovery tool, it should be installed to either a friend’s PC or family PC. You can as well borrow a PC for the purpose of burning the recovery file into your media type. Once the burning is complete, simply plug in you removable media into your own PC to start password reset. For this process, your removable media will be formatted. Make sure you back up the contents or go for an empty media. Click Burn USB or Burn CD/DVD depending on your chosen media type. Wait until you see “Burning successfully” pop up. Remove your USB flash drive. Boot your system to BIOS setup and choose the Boot tab to configure boot priority/order. The save changes to reboot your system. 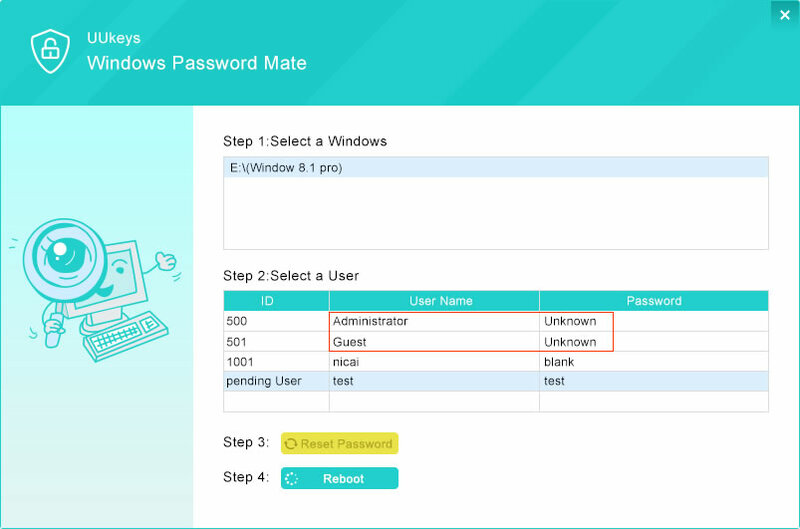 Click Reset Password to wipe the user account password. Nothing will be lost. After the password reset is successful, the Reboot. If you had followed the guidelines carefully, you would see that UUkey password recovery worked like a charm within few steps. All you need to do is to add password to your account under User Account settings in control panel. I hope you really found this guide helpful! Nice. I will try this out.